History of Nexus Phone Pricing – Why the High Price for the Nexus 6? You are standing in a carrier store, staring at a mystery phone on a shelf that sits next to the Galaxy Note 4 and LG G3. Like those phones, it has top tier specs, including a 6-inch QHD display, Snapdragon 805 processor, 13MP camera with optical image stabilization, premium metal build, and is made by Motorola. It looks gorgeous and feels amazing in hand, even for a big device. Those other phones cost anywhere from $599 to $825 without a contract (depending on the carrier), or between $199 and $299 with one. After toying with all three phones for a few minutes, you decide that the mystery Motorola device might be the phone for you. So how much are you willing to pay for it? What if I told you that it was $649 without a contract? Would you be offended by that? As you probably figured out, I am talking about the Nexus 6. In a few weeks, you will be standing in your local carrier store in this sort of situation, trying to decide if the Nexus 6 is better than devices like the Galaxy Note 4 or LG G3 or HTC One (M8). And while on paper it certainly matches up nicely to all current phones, even besting many of them, I get the feeling that the price is going to be a sticking point when making a decision about it. Yesterday, Google announced that the Nexus 6 would be available in November through Google Play with a full retail price of $649 if you want 32GB of storage, or $699 if you want 64GB. They also announced for the first time in the history of the Nexus platform that the device would be sold at all major US carriers, but that we would have to wait to hear their pricing models. There are a couple of items here to talk about, but let’s first talk about carriers. T-Mobile told us that on November 12, we can buy a Nexus 6 for $0 and with 24 monthly payments of $27.08. Do a little math there and you come up with $649, which matches Google’s pricing. But what about the rest of the crowd? One could assume that there will be both on-contract and off-contract pricing. However, we have no idea what AT&T and Verizon will come in at. Are we talking Galaxy Note-like $299 on-contract pricing, with an off-contract price pushing $825, which is where AT&T has priced the Note 4? Or will carriers stick to the $649 and $699 off contract price to match Google Play, and then decide to either go $199 or $299 with a two-year contract? We will hopefully know soon enough. On the flip side of this equation, we have had a lot of conversation surrounding the pricing of the Nexus 6 as being higher than normal for a Nexus phone. Is it high, though? 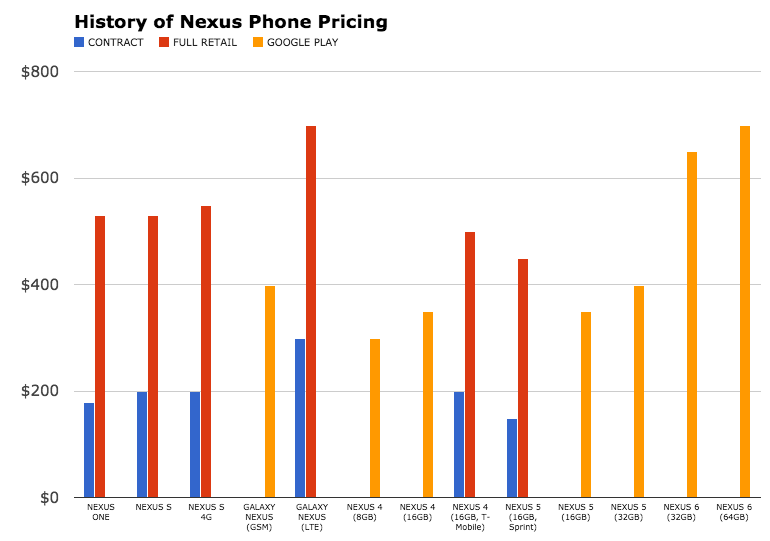 After looking back at the history of Nexus phone pricing, I would tend to argue that it is a bit higher than normal. Take a look at the chart below. As you can see, Google has typically sold phones through Google Play at much cheaper than if you were to buy similar phones through a carrier. For example, T-Mobile and Sprint each sold the Nexus 5 with 16GB of storage for $449 at full retail. T-Mobile actually admitted that that was the price they paid for the phone, so that’s why they were selling them at $100 more than Google ($349). In other words, Google was either taking a hit when they sold you a Nexus 5 through Google Play or LG was cutting them some sort of deal since they partnered together to make the phone. Or you could look at the Galaxy Nexus when sold as either a GSM unlocked phone or as an LTE variant through Verizon. Google sold the Galaxy Nexus directly for $399, whereas Verizon wanted $699 for it without a contract, or $299 with a 2-year deal. Granted, Verizon’s version had an LTE chip inside it that was still a new technology, but is anyone really buying the idea that an LTE chip added $300 in value to that phone? I’m not. So what’s the conclusion here? Well, I have a couple of thoughts. First, the Galaxy Note 4 runs $699 off-contract at Verizon, $749 at T-Mobile, and $825 at AT&T. The Nexus 6 is almost identical to it in terms of specs, outside of the slightly larger display. One could argue that Google is once again taking a slight hit on the Nexus 6 to undercut the competition or has at least negotiated a better price out of the gate. And keep in mind that the phone is made by Motorola, a company who released the new Moto X at $99 and $499 to try and undercut the competition. My other thought is that the sticker shock you all have (including myself) is somewhat warranted. At one point, we were all under the impression that with the original Nexus 7, Google was willing to make almost zero profit on sales of the device because they wanted people to buy into their ecosystem instead, which had a potentially larger return in the grand scheme of things. But with the Nexus 6, T-Mobile already outed the fact that they are selling you the phone for $649, the same price as Google, which is likely what they are paying for it. In other words, Google isn’t taking a hit this time around to get you into their new phone for cheaper. One thing is certain, though, the Nexus 6 will be available for the first time at your carrier of choice, which is a win for everyone. Just keep in mind that new beginnings often times mean changes and trade-offs, whether you asked for them or not.